From Hokianga to Wellington: Woman beating Cancer to present at the Beehive. Tanya states that the cost of natural therapies means many people are not able to access the treatment that is helping her. “People are mortgaging their homes so they can have treatments that give them quality of life. It just shouldn’t be so hard, so stressful, when you’re battling this disease anyway”. She says that while she is grateful she had surgery, chemotherapy, and radiation and is not saying that people shouldn’t have these treatments, she believes people should have choices, especially when Western medicine is no longer able to offer anything more. “It’s about choices, and quality of life”. Over two and a half years since Tanya was told she was dying, she continues to live well at her home overlooking the Hokianga Harbour. In fact, Tanya feels so well that she is now campaigning to make things easier for others who have been terminally diagnosed. With friend and film-maker Jessie McVeagh, Tanya has produced He Oranga Pumau, a documentary about her healing journey. Their documentary has sparked a campaign for the rights for people to choose their medical treatment and to gain better support for those diagnosed with serious or terminal illness. Tanya and Jessie are touring the North with their film, and are about to head south, culminating in a screening at parliament on June the 20th this year. They hope Tanya’s story will lead to people having choices in their treatment, and better support when they are diagnosed with terminal and serious illness. Tanya states that “Rongoa is a taonga, and as such is guaranteed to us in Article Two of Te Tiriti o Waitangi. People should also be allowed to work through illness in a way that empowers them. We are calling for funding to be made available for rongoa, natural therapies including vitamin C”. 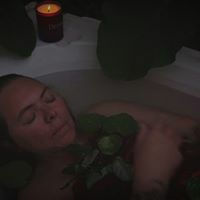 In the image above, Tanya is taking a Kawakawa bath. The NZ Journal of Natural Medicine frequently features information about a variety of cancer therapies. We also have information about some treatment options available on our website..
Our website includes a review of one of Dr. Gonzalez book One Man Alone, about the development of a successful non toxic cancer treatment which you may read by clicking HERE and a review of one of his DVDs which you may read by clicking HERE.